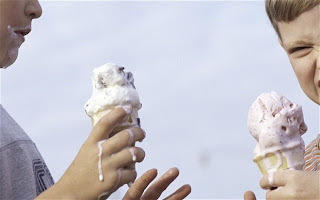 Scientists have explained why eating ice cream too quickly can cause a painful headache - commonly known as brain freeze. The instant headache brought on by ice cold food and drinks is the bane of the summer with ice-cream lovers often seen clutching their foreheads waiting for the gripping pain to ease. Scientists have noticed that migraine sufferers are more prone to 'brain freeze' and wondered if the phenomenon could be turned to their advantage. It was found that the pain was brought on by a rapid increase in blood flow through a major blood vessel in the brain, the anterior cerebral artery. The ache subsided again once blood flow was restricted. It was found that the anterior cerebral artery dilated rapidly and flooded the brain with blood in conjunction to when the volunteers felt pain. Soon after this dilation occurred, the same vessel constricted as the volunteers' pain receded. Co-author Jorge Serrador of Harvard Medical School and the War Related Illness and Injury Study Centre of the Veterans Affairs New Jersey Health Care System, said: "The brain is one of the relatively important organs in the body, and it needs to be working all the time. "It's fairly sensitive to temperature, so vasodilatation might be moving warm blood inside tissue to make sure the brain stays warm."